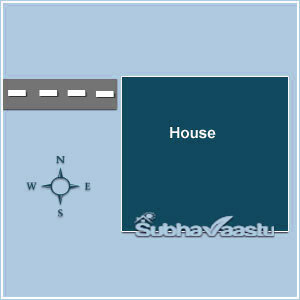 When a road hits the property from Northwest-west direction that road is called as Northwest-west street focus or that property is called as Northwest-west property, that property may be a house or factory or a choultry or even a plot. In this image the street is hitting one house, this street is called as Northwest-west Street focus or that house is called as Northwest-west street focus house. In some areas, it is also called as Paschim Vayavya Ghar. A unique feature of this street thrust is being successful in all situations, problems, litigations etc. These houses are very special to personnel in the following fields – politics, legal, real estate business, law enforcing police officials, religious leaders and the like. 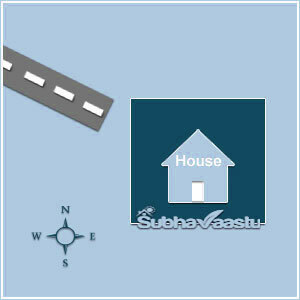 As often said it is essential that the house be vastu compliant. For even though the benevolent street thrust does bestow its influence, when the house is not own malignant component too, with the result the residents would feel good at times and miserable at other times. Further, there is every possibility of a situation where even when success is a natural phenomenon in a given situation it may even elude. This is also said to be Paschim Vayavya Ghar, but there is lots of difference when compared with genuine Western Northwest road thrust. The endpoint for this street focus is towards Western Northwest part of the house, but the origin does not come from Western-northwest direction, it collecting the results from the Northwest part, so we cannot believe this street focus. In terms of 45 to 135 degrees also we should be very careful. 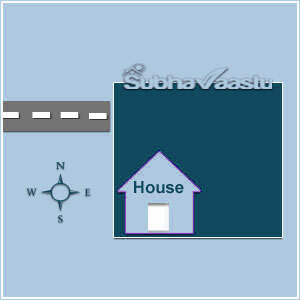 Only when the land or plot or site is according to 90 degrees and having western northwest street focus then we may show interest to show that property with one expert vastu consultant and later decides for settle it. 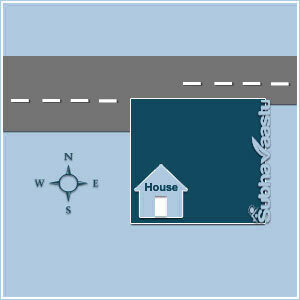 Here the Street focus is hitting to the house towards Northwest-west part, but it starts fromWest direction, so there is a difference in results from this road thrust. Careful observation is too important when we deal with street focus properties. Observe the house in this image, the house is having good East open space, such open space will be greatly beneficial to people in the political field and the like. If there be open space in the North to (in addition to that in East ) it would result in unimaginable good things happening. 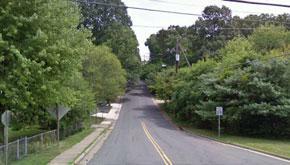 You may observe in this image, there is good enough open space towards North direction here. Residents of such houses will succeed in their respective ventures or activities. Observe this flash file, this is for your kind information only, this file may not visible in Table pcs or in mobile phones. Please note that in this flash file there is a mistake occurs that is Northwest-North Street focus, please read it as Northwest -west street focus. Kindly excuse for this mistake. We can do this alteration directly to that file, but the staff who knows the Flash work was in long leave, so at present, we cannot do the alterations to this file. Sorry for the inconvenience caused. 2. Street thrust happening consequent to encroachment. Encroachment situations would invariably occur in northwest blocks, (here we have shown only encroachment, not in a Northwest block) If in such cases West direction side is at a higher level and East receding the benevolent effects would be far more than otherwise. In all such cases, small modifications in the house construction would be greatly helpful for happy future. Please observe the above image and this image, there is a slight difference in between these two images, the above image property is more good than this property, in this image the West road passed towards North direction, so there is a slight difference in getting good results. But both houses are same as above one and this house. Same measurements and the same quality and same structure, but there is a slight difference in surroundings in the name of West road. So think on the depth of the subject. 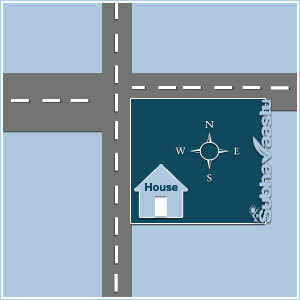 That is why we are requesting all the visitors to approach only the expert vastu consultant before buying the property. If you are looking for lesser payment and contacting the half knowledge vastu pandit, you may lose your hardship. The ball is in your court, take the right decision and change your way of life. West encroachment is always wrong. That you will know in coming pages. Can a deity room be provided in Northeast? 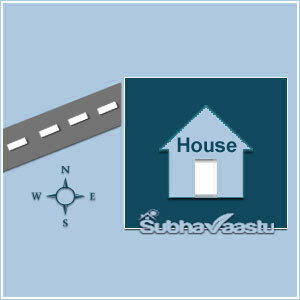 Vastu consultant in California, need guidance? How to fill the well, when it exists in prohibited place? How to construct a staircase in or outside of the house? In which direction the compound walls should be higher? I first came to know about this website in 2009 while I was casually searching about bastu consultants in Google search engine. Since then I have very good relation with Suresh garu not only on vaastu matters and in personal as well. For the first time when I asked about consultation fee I thought it will be high. But to my surprise the charges were very less and the services are of class in nature. I realized many vaastu consultants who give solution but hesitant to answer in detail for questions and or clarify the doubts on the discussed plan/house. But Suresh garu was kind enough to answer all my queries in detail and patiently. I amazed about his clarity & command on the subject. I also realized that the major portion of his service charges is reinvested in developing the website (subhavaastu) which is useful for the persons like me. After going through this web site in detail, it gives me a confidence that the other vaastu sites neither this exhaustive nor the consultant is co-operative as I noticed there will be only contact details. Suresh garu gives free services to government offices and Army personnel. This approach from him impressed me a lot. Occasionally we feel to get the services in cheaper rates, but it could be catastrophic if the changes made (to the plan/house) could be wrong as we do not have the right information/clarification. Based on my experience with Suresh garu, his services are excellent and the prices are affordable. It is always better to approach a professional doctor when we are in need of a treatment for disease. As mentioned earlier his service charges are very less, for comparison I can say we pay $1 USD for $10 USD worth of services. I do not have any hesitation in recommending him for (y)our needs based on my experience - T. Bharath Kumar Reddy - Rayachoti - Kadapa Dist - Andhra Pradesh - India.